Word is just in from people on the ground in Pennsylvania that the 36 tons of radioactive frack sludge, that we reported on in August (here and here) and September, were moved yesterday from the impoundment site in Washington County where they have been stored in limbo for many months. Radioactive frack sludge in Washington County, held for months at a Range Resource waste impoundment site, is now off the site and gone to who knows where. Submitted photo. 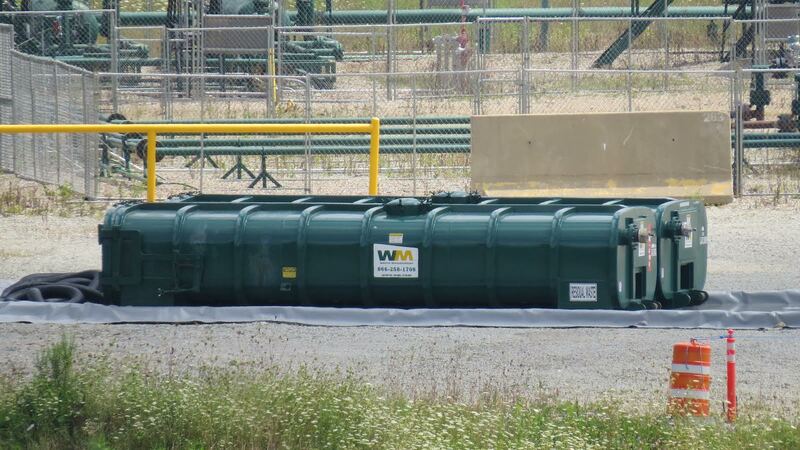 The material was approved by the Michigan DEQ for shipment to Michigan last August to Michigan/Wayne Disposal, a private processing and landfill facility in Van Buren Township near Belleville. 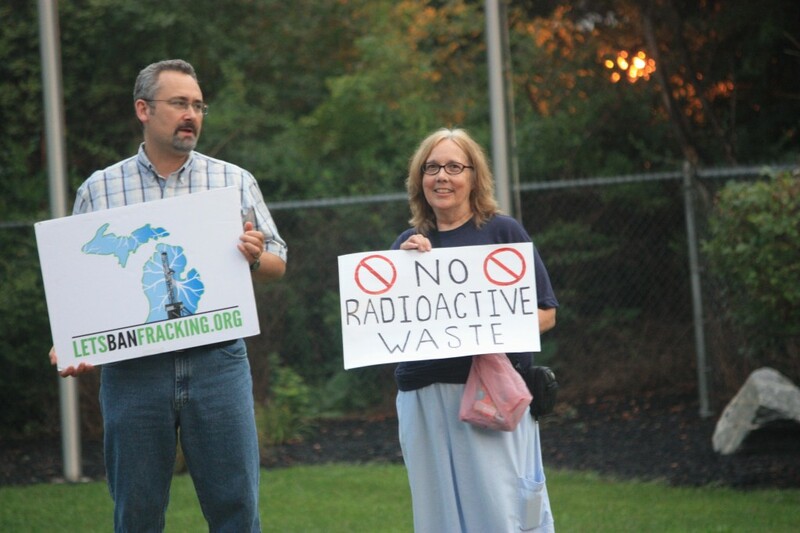 After our reporting and subsequent publicity in the Detroit Free Press, the company, now owned by frack waste giant US Ecology, agreed to temporarily halt further shipments of radioactive waste pending a review of procedures by a governor-appointed TENORM panel. Theoretically, the approval has still been granted and it wouldn’t be illegal for it to be brought to the Michigan facility, just perhaps not politically acceptable. According to the Michigan Department of Environmental Quality, the shipment is likely not coming here to Michigan, due to the ongoing voluntary action by US Ecology. Ken Yale, who I spoke to yesterday, said he didn’t think that the company would risk taking the 36 tons from PA during their self-imposed moratorium when they are taking in over 400,000 tons per year of hazardous wastes. Today I contacted Pennsylvania’s Department of Environmental Protection for some answers. As of 4:00 pm they have have not called back with a reply as to where the waste is going, after I spoke with someone in the Communications department. Where the wastes are going, however, is anyone’s guess. In other news, the application or request by US Ecology to take in waste at higher radiation levels at the Van Buren County Wayne Disposal Facility has been withdrawn, according to DEQ’s Ken Yale. 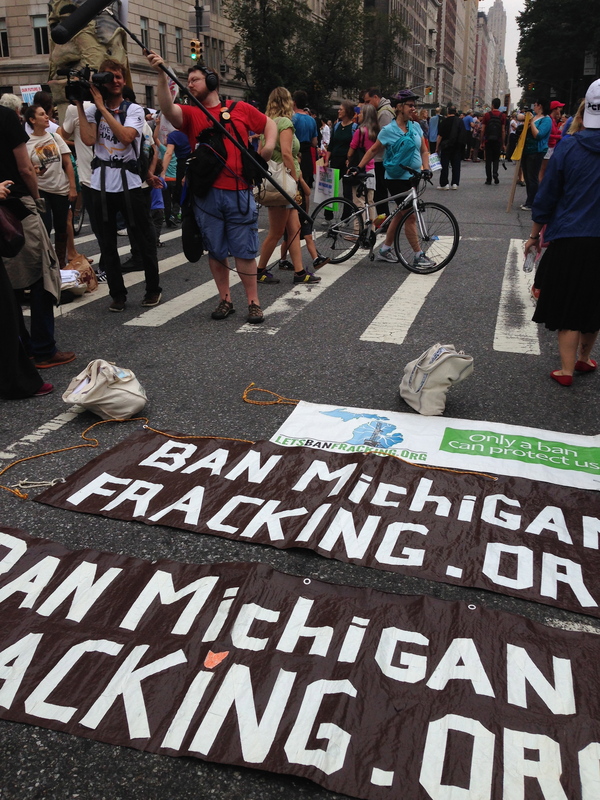 Ban Michigan Fracking paid for a copy of that application or proposal through a Freedom of Information Act request and we are still awaiting its arrival. 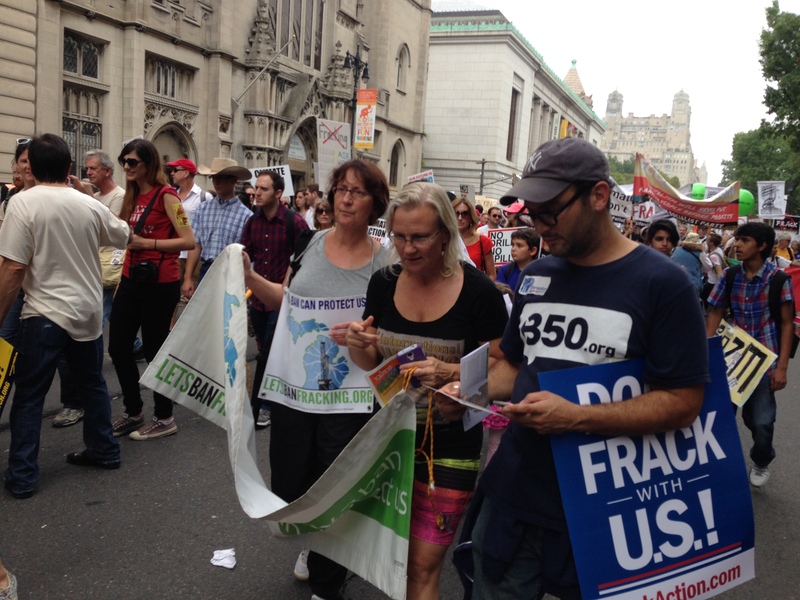 The People’s Climate March in New York City on Sunday September 21 was seen by many as a turning point for the climate movement. It definitely was a start. Four hundred thousand people walked, an amazing number, ten times the size of the previous climate march in Washington in February 2013. Organizers say there were 1574 participating organizations, 630,000 social media posts, and 5200 articles written. Around the world 2646 allied events took place in 162 countries. The New York Times featured the worldwide events the next day on the front page, noting that this summer “was the hottest on record for the globe, and that 2014 was on track to break the record for the hottest year, set in 2010.” (Yet one week later on September 27, an activist noted the same paper did not have a single article on #climate). The two-mile-long march was led by indigenous people and frontline communities — those most immediately impacted by climate change. The line stepped off from Broadway and Columbus Circle at 11:30 am. An hour and a half later, we in the anti-frack contingent a mile to the north on Central Park West waited for the backward sweep of the starting signal to reach us. At that moment, a 2-minute lull of eerie silence fell upon the procession — signaled in advance by organizers’ text messages. Then followed an amazing sound. At first it was like like a careening jet airplane, faint but scary. It increased exponentially, becoming human as it surged toward us through the crowd, an overwhelming wave of voices, erupting finally around us, in a massive and sustained ecstatic communal roar. Soon we were on our way. 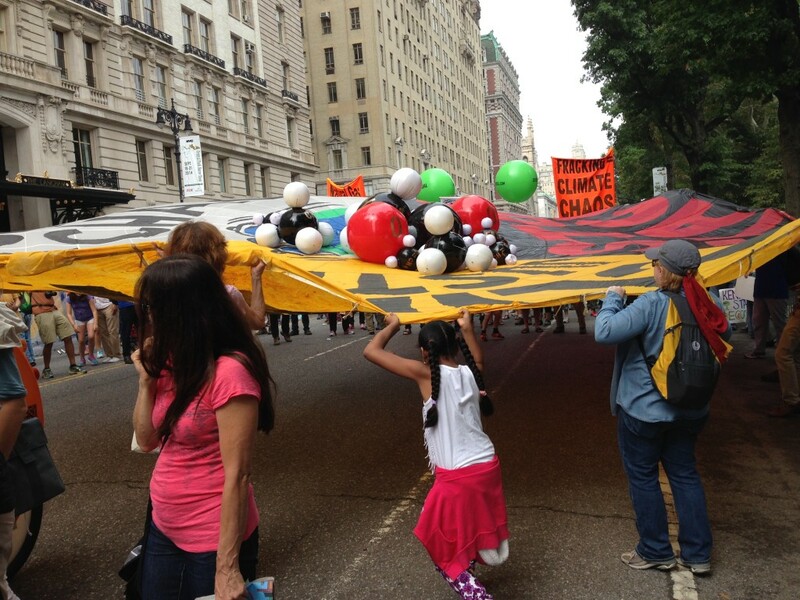 The crowd featured majestic banners, pageantry, diversity, young people of color, political and diplomatic officials, victims of superstorm Sandy, labor unions, grassroots enviro groups, Big Greens, celebrities, socialists, anarchists, homeless, and everyone else. There was a remarkable humanitarian and internationalist spirit. 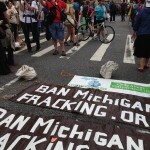 Activists in the Committee to Ban Fracking in Michigan were among 400 people from Michigan at the march, including 322 that came in seven buses and 40 in four vans. 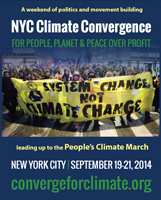 On Friday and Saturday before the march, the Global Climate Convergence (endorsed by Ban Michigan Fracking), a two-day conference organized by grassroots activists held in lower Manhattan, offered over 100 workshops and two plenaries, attended by 2500 people, including a session on “Frack Bans with Teeth” by BMF’s LuAnne Kozma on the Committee to Ban Fracking in Michigan’s ballot initiative. In contrast to the goals of the March, the Climate Convergence Conference called for people, planet, and peace over profit. More particularly: full employment, 100% clean renewable energy, universal free healthcare and education, securing the global food supply, economic democracy, demilitarization, and end to mass incarceration and deportations, political democracy, civil liberties, and support for peace, human rights, and rights of Mother Earth. At #FloodWallStreet, photo by LuAnne Kozma. 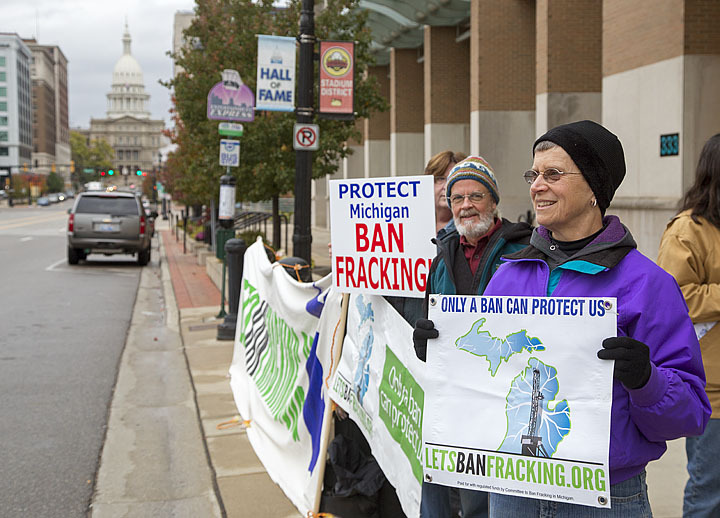 Ban Michigan Fracking’s purpose is to educate and advocate so that we stop fostering fossil fuels and in particular, stop the frack industry here as part of the overall movement to ban the frack industry globally. A cultural shift is needed, too. 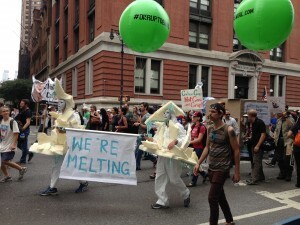 Most people are dubious of corporations and of government, the main creators of the climate problem in the first place. 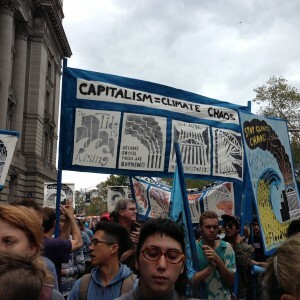 But equally, most people don’t have a clear political vision, and have no objection to the political elite and corporate executives who joined the march. Our country has a conservative ideology and political system, and a culture of acquisitive individualism. To save the planet and ourselves, the majority will have to rise against the few whose commitment is to money and power. Only such a transformation will allow the technical solutions to flower. CH4 and CO2 models getting tossed around at the People's Climate March.